Sushi, in Austin? You bet! 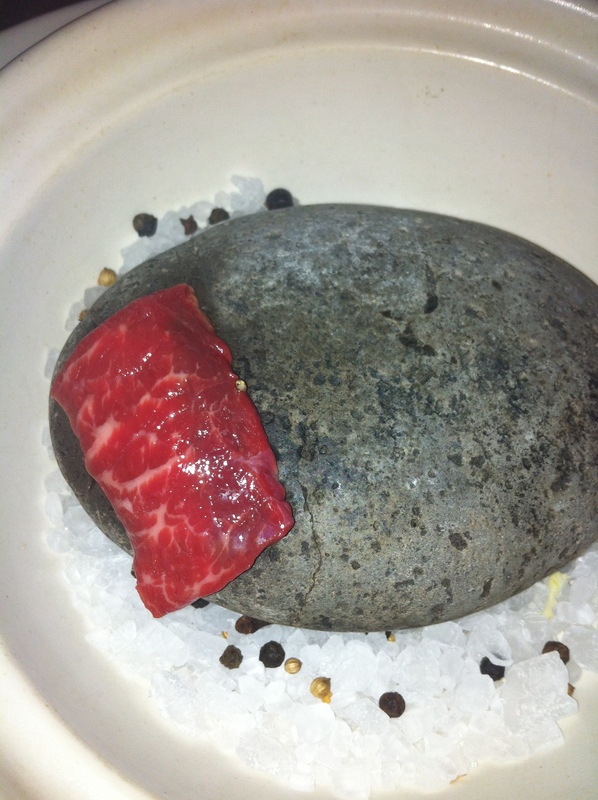 Uchiko is the place to go. Following our dinner, we spent approximately 9 hours holed up in a conference room working together: exchanging information, setting strategy, and simply chatting. But, at dinner…we talked about Austin, cooking, family, pets, and this blog. After explaining my indecisive nature, I surrendered my evening’s meal over to my hosts for the evening (after they’d been appropriately educated as to my “no-gos”). So, where did said team invite me to join them for dinner? Only to the (second) best sushi joint in Austin. Second, only because the owners of “the best” sushi spot opened a second location – which is where we dined. 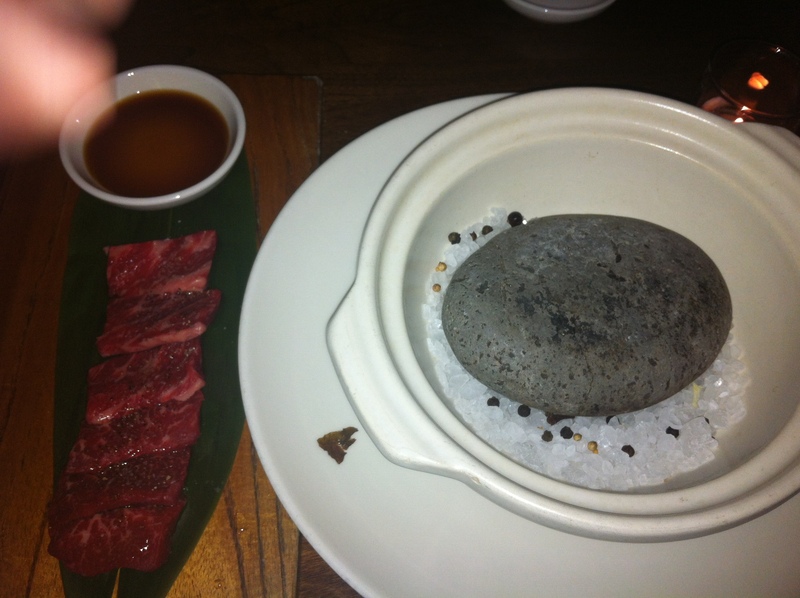 We met at Uchiko – a well-renowned sushi restaurant. We started off with the Innocenti Malbec 2011 La Consulta Mendoza. My companions didn’t know this, but I do love a good Malbec. I noticed that this particular wine left a heavy sugar residue in my glass. I can dig that! It means it’s “thick” (to quote a friend and coworker of mine). I had never thought to use that word to describe my “go-to” label, but hindsight being 20/20, my friend Cody was right. As with Layer Cake, Innocenti had a rich, spicy, and elegant flavor that I thoroughly enjoyed. 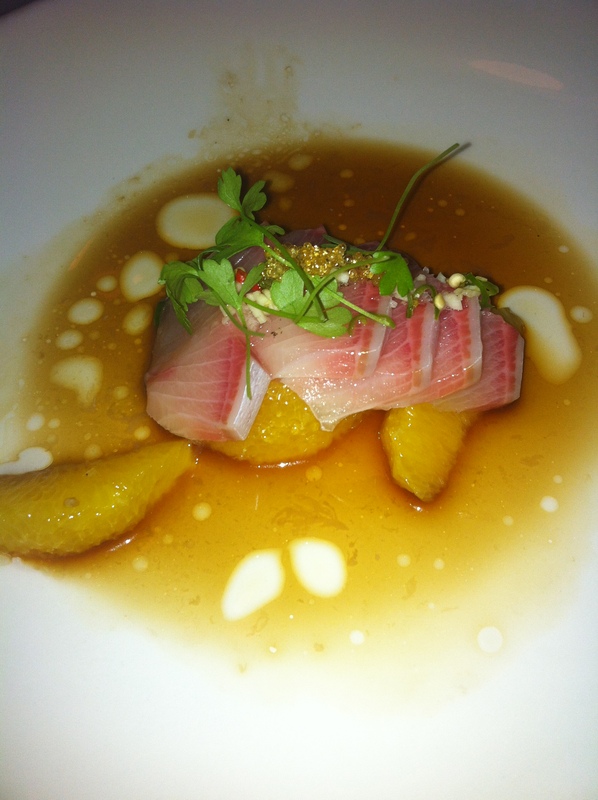 Then, we ordered the grilled edamame and roasted golden beets. And, Jordan, who was one of the de-facto hosts of the evening, suggested that we order some crispy brussel sprouts with lemon and chili. Oh. Dear. Lord. They. Were. DELICIOUS!! I’m pretty sure I ate most of the contents of this particular bowl! 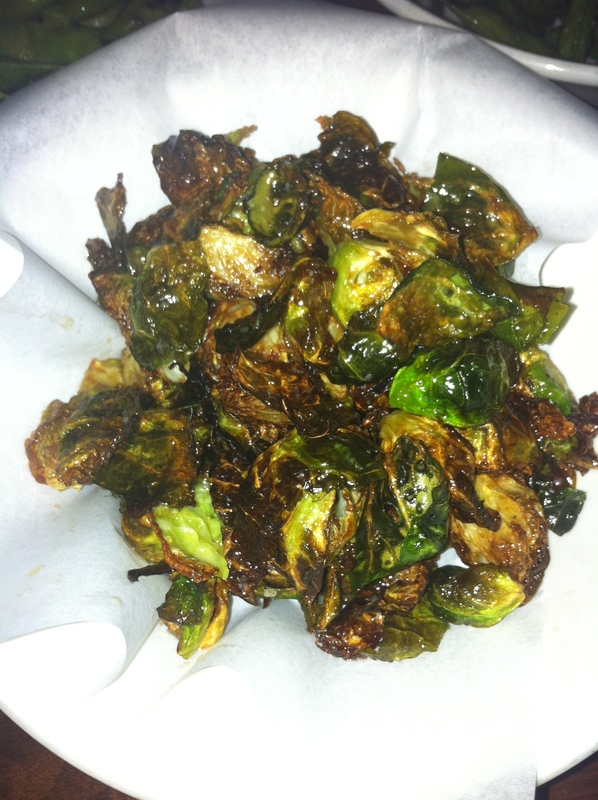 We followed the most amazing Brussel Sprouts evah! with the hama chili, which was delightful! Not nearly as spicy as I had anticipated, but it had a nice flavor balance with the tuna, pepper and orange. I’m not sure that I’m going to accurately capture everything else that followed. It seemed that beautifully plated dishes were being delivered at breakneck speed that night! However, I can assure you that everything we tried that evening was 1) enjoyed by all, and 2) devoured such that the bussers (who were “Johnny on the spot” quick) took only clean plates away. Folks, the food was THAT good. And, the service was top-notch. 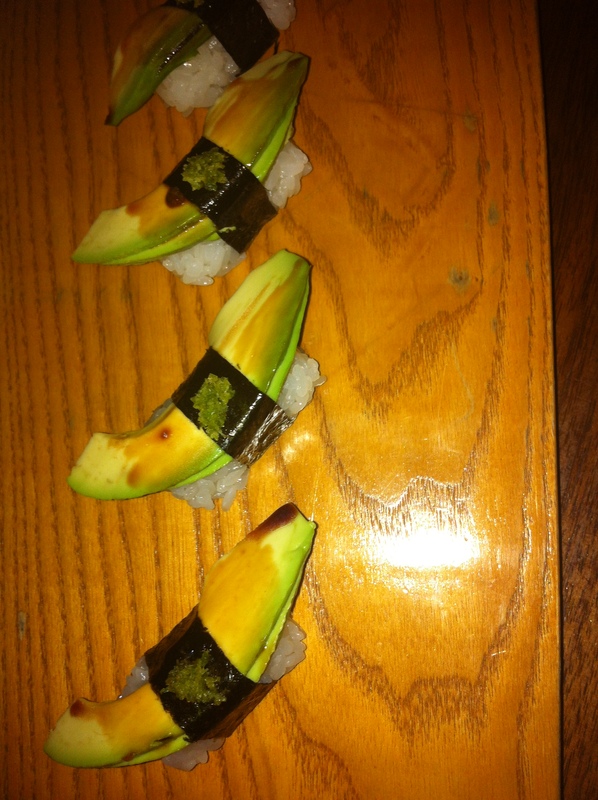 Following the delights I have already mentioned, we had the avocado and nasu. Then, we finished the evening with an incredibly unique and delicious dessert. 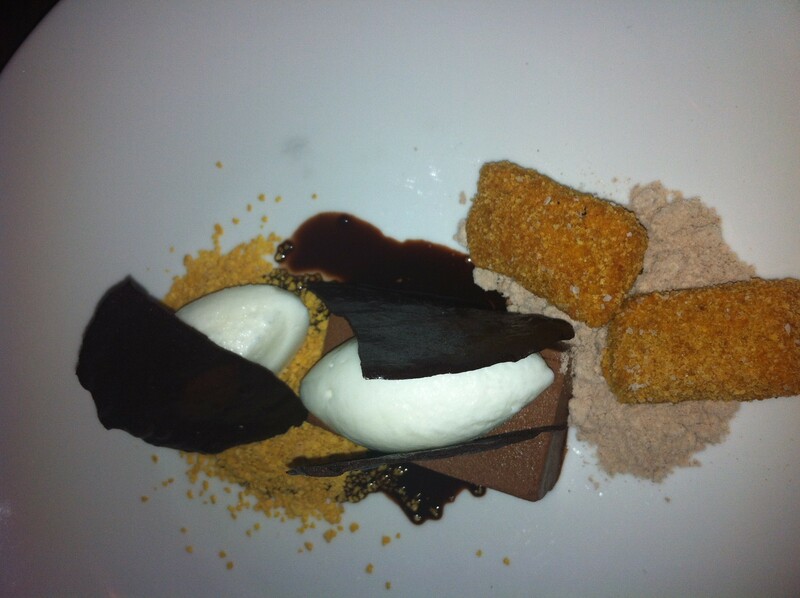 Our table describes the fried milk as a new take on deconstructed s’mores, of sorts. Imagine frozen milk – deep-fried, and served with chocolate, sugar, and cream. 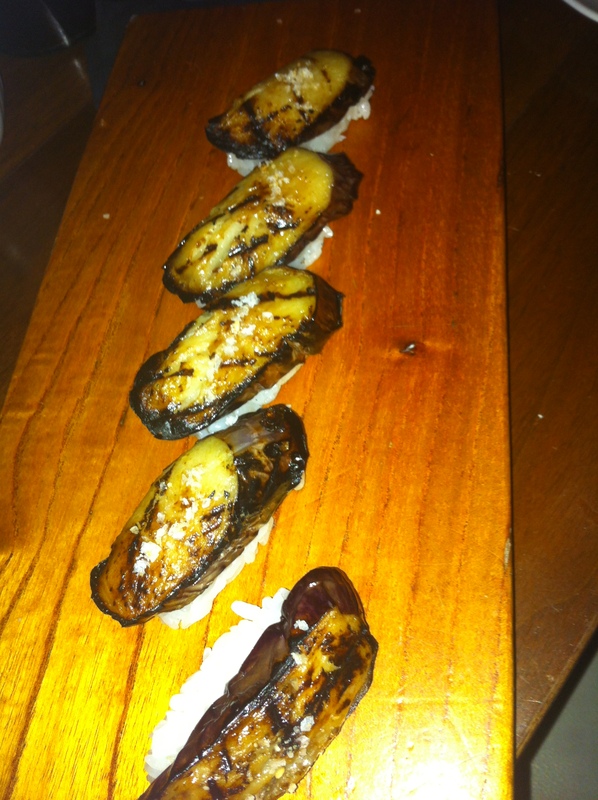 It may not look like much, but believe me…it was a perfect finish to this fabulous dining experience. P.S. Next time I’m in Austin (which shall be in March), what places are on the not-to-miss list? Please leave a comment. Fried milk sounds pretty interesting and good. I bet SXSW is insane each year. Ant, the fried milk was interesting, and quite tasty! I’ve never seen anything like it, except perhaps on Top Chef. I have never been to SxSW, but I’ve heard great things! Perhaps someday I’ll make the trek.